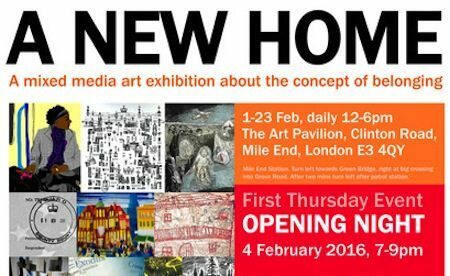 Tonight (February 4th) sees the opening of A New Home, a mixed media art exhibition about the concept of belonging, at the Art Pavilion in Mile End Park. The exhibition follows ArtCatchers‘ successful Misbehaviour exhibition of last year and features contributions by members of the East London Printmakers print studio and guest artists from in- and outside the UK. The exhibition is presented by London artist and curator Katya Rosenberg and hosted by Tower Hamlets. Once again the Geezers are involved. Since last year’s pub installation and Where’s My Boozer Gone event they have worked with Lucy Schofield on her interactive art taxi which she initially developed as part of their Where’s My Boozer Gone? campaign. Watch out for it on its Saturday tours of the historic pubs in the neighbourhood (see below). Here is a list of the exhibition events over the next month. 30 minute tours through the exhibition for minimum numbers of three participants. Experience the atmosphere of the disappearing East London pub in the mobile saloon bar, interact with locals and enjoy a game of pub top trumps. Expect the unexpected and take a tour around the East End in the Cabfessional directed by you and your own stories. Arteast is a disabilities arts group that runs at Bromley by Bow Centre. Arteast have been making a Chinese new Year Dragon to celebrate Chinese New Year and will bring the dragon to the exhibition. All welcome to join the workshop where you will be able to make a small hand held Dragon’s Head and take part in a Dragon Dance. Canon Steven Saxby of the Walthamstow Migrants Action Group, Rita Chadha, Chief Executive of the Refugee and Migrants Forum Essex and London (RAMFEL) and volunteers of the Walthamstow Migrants’ Support Centre share their experience of running their project and share points of consideration for offering drop in advice services for fellow citizens with migration backgrounds. We would love to meet volunteers of similar projects on the night and hear their thoughts and experiences too. A relaxed and informal evening with some drinks and nibbles. Draw the place you would like to live and turn it into a printing block. Help to make a village with all the prints – and have a copy to take away with you. All ages welcome – children must be accompanied by an adult. Back by popular demand, the event will take place at the Art Pavilion in Mile End Park and will explore issues around programming, fundraising and reaching out to the wider community. Guest Speakers include Beci Jamieson, Arts Council England’s Relationship Manager for Children, Young People and Learning across the Combined Arts, London, and others. Click here for more info about the exhibition and a breakdown of the works on offer. Previous Post:Only 3 Days To Go!